In this issue â€“ and the following issues â€“ I will now write a little more about some of the favorite slots that my readers have told me they like to play, and also show you some of the great new slots that are now available in your favorite casino. In this issue, I present Hit The Heightsâ„¢, by Aristocrat, and a short description of the game and how to play it. Many years ago â€“ and it doesnâ€™t seem so many years ago to me â€“ there was a casino on the Las Vegas Strip called: Vegas World. It was built, owned, and operated by Bob Stupak, a legendary Las Vegas gambler, entrepreneur, and visionary. I knew Bob, and spent time with him at Vegas World, in a little booth in the coffee shop that served as his de-facto office. I also spent time with him at his house, a sprawling old-Las Vegas mansion with the dÃ©cor to match. I wrote an article about him and his vision for “The tallest tower in the West.” That was about 18 years ago. Bob died on September 25, 2009. He was one of the icons of Las Vegas, and I miss him, and people like him. But the reason that I begin this article with his story is because at the front of Vegas World, Bob had a huge rocket pointed skyward, with the slogan: The Skyâ€™s The Limit! That was his motto, and his knack for promotion. He once said that he would pay $1 million to anyone who would jump from the top of his casino and land safely. One such skydiver took him up on it, climbed to the top of the casino, jumped off, and landed safely in Bobâ€™s parking lot. Cameras rolling, Bob proudly presented the man with a check for $1 million â€“ and then handed him a bill for $999,999.00, as the landing fee! So, for essentially $1 Bob got all of this publicity for his casino. Well, that was Bob alright. Today, the Vegas World casino is history, and the Stratosphere now stands in its place. Bob got his tower, and the world can thank Bob Stupak, and others like him, for making Las Vegas the greatest gambling city in the world. He was one of the best. Speaking of best, there is a new multiline video slot machine from Aristocrat, called: Hit The Heights. I saw this game at the recent gaming convention in Las Vegas, and by the time you read this article the game will be in your favorite casino. Like Stupakâ€™s rocket, this game also reaches for the sky, and thatâ€™s why it reminded me of the story of Bob, his casino, his rocket, and his motto: The Skyâ€™s The Limit! Because there is so much to say about this great game, I will divide this article into two, beginning here with some of the main game descriptions, and continuing in the next issue with some more of the details. Hit The Heights is a new game that is big in design and fun. Customized with a tower topper that stands out anywhere on the casino floor, the rocket-style theme and bonus features give you a complete interactive and entertaining experience. Hit The Heights incorporates two video wheel bonuses, one unique to the game, and a second Hit The Heights bonus common in all games. 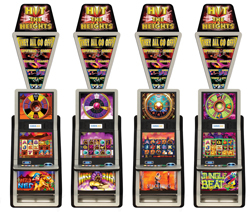 When you enter the Hit The Heights bonus, you are prompted to touch the screen and launch rockets up to the video wheel in the top box. When the wheel is filled with possible prizes, it spins, shooting fireworks. As the wheel spins the dynamic prizes get bigger, and the higher you go up on the level at the top rocket. The number of times the wheel spins is random, increasing the anticipation of the win. If the fireworks stop on a credit prize, you win that prize. And if the firework stops on a Hit The Heights prize, you are awarded a mystery bonus prize based on the level you achieved in the top rocket. The game is a minimum of 35 credits (25 credits + 10 credit ante-bet) to be eligible to win the Hit The Heights bonus feature, or another wheel bonus feature unique to each base game. Hit The Heights is powered by Aristocratâ€™s GEN7â„¢ platform, housed in Aristocratâ€™s award-winning VIRIDIANâ„¢ cabinet and comes with choice of four base games: Jungle Beatâ„¢, Space Kingâ„¢, Wild Nedâ„¢ and Wish Bigâ„¢. I will write more about these four games in the next issue. This feature can be triggered with any bought game, and won at random on any of the 4 Hit The Heights base games. When you begin, you first shoot the fireworks, as I described earlier. When the wheel fills up with prizes, it spins. The longer it spins, the bigger the prizes get. The top tower of prizes displays 6 different Firework bonus prizes, and the higher up the tower you are able to get, the greater the bonus prize will be. You can also win either a credit prize, OR trigger a Hit the Heights Firework Bonus prize. More on this great game in next monthâ€™s issue.